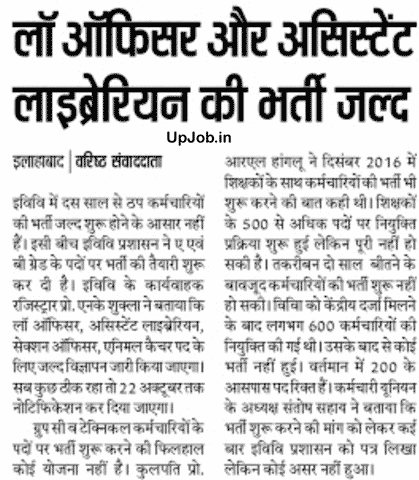 There are very good news for candidates waiting for the recruitment of Law officers in Uttar Pradesh. Allahabad University (AU) is going to issue notification for recruitment to the post of Law Officer and Assistant Librarian. While the recruitment of employees who have been locked down in Allahabad University for the last 10 years, is unlikely to start soon. Meanwhile, Allahabad University (UOA) administration has started preparations for recruitment on Grade A and Grade B posts. Professor N K Shukla, officiating registrar of Allahabad Vishwavidyalaya, said that the advertisement will soon released for the post of office assistant, librarian, section officer. If everything is okay, the notification will be released online by October 22. There are currently no plans for recruitment to Group C and Technical Staff posts. Vice Chancellor Professor had said in December 2016 to start recruiting employees with teachers. The appointment process began on more than 500 posts of teachers, but it has not yet been completed. Even after nearly 2 years have passed, the recruitment of employees has not started. After getting the central status of the university, about 600 employees were appointed. Since then no recruitment has yet taken place. At present, more than 200 posts are vacant in the University. Employees Union President Santosh Sahay said that many times the Allahabad University wrote a letter to the administration regarding the demand for recruitment, but no decision has been made so far. All important information regarding the recruitment to the posts of Law Officers and Assistant Librarian will be provided on the official website of upjob.in. Therefore, all the candidates are advised that they continue visit on the UP Job Official website, so that as soon as the information of the officer Uttar Pradesh recruitment 2018 is issued, we can get it to you immediately.